EV9D9 is a framework for performance that enables a unique context for improvisation by allowing each performer to simultaneously create and refine their own code while enabling access to the other performers code. This framework pits multiple domains of expertise against one another as the novice has total, if not bumbling, control over the experts’ precision. As each performer attempts to interrupt, change, or break the other performers line of thought, while simultaneously maintaining the integrity and functionality of their own code, new improvisatory threads emerge only to be quickly diverted toward unsuspecting musical and visual territories. 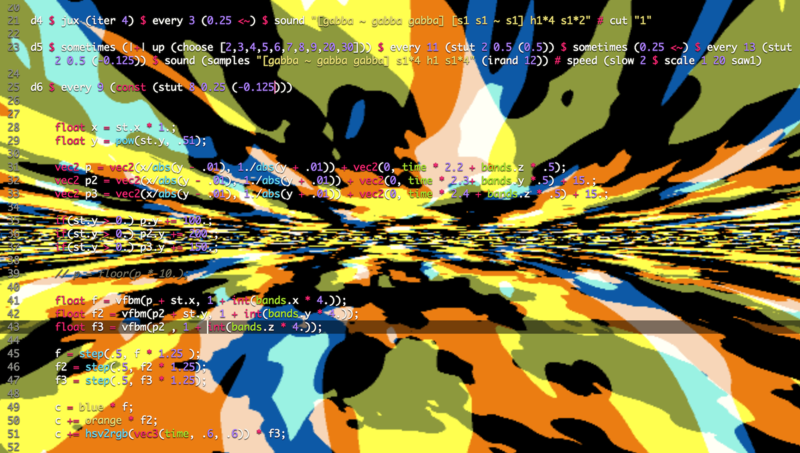 Visuals are live-coded in Google Chrome using the OpenGL fragment shader language. Audio is live-coded in Google Chrome using TidalCycles.